Humboldt squid have long had a reputation as devils of the sea, famed for dragging divers down to their death and cannibalistic decapitations of one another. Many old sea tales turn out to be just that, tales; the Humboldt squid however does deserve at least a modicum of its aforementioned reputation. Within their arsenal they have a two-inch long beak and tentacles covered in suckers lined with sharp teeth. They have been reported to have torn off masks of divers and engaged in cannibalistic activities amongst one another. It seems then that this is not an ocean creature to be messed with. Recent research has shed light into the lives of these mysterious predators. As a large pelagic species they play an important ecological role in the habitats in which they exist. As predators they are known to target a variety of prey, including lanterfishes, krill and other squids. As adults they have been known to take on larger deep-sea living fish. Despite their formidable speed and reputation, they also serve as prey for larger species such as sperm whales, sharks and teleost fish. Cephalopods, the group consisting of squids, octopus, cuttlefish and nautilus, are well known for there colour changing abilities. They are able to do this due to a specialised skin cell known as a chromatophore. Through the contraction of muscles the animals are able to alter the translucency, opacity or reflectivity of the cell. The results can be mesmerizing, with octopus and cuttlefish using them for incredible displays as well as fascinating camoflauge. Humboldt squid are not quite so blessed however, their have single colour chromatophores, namely white and red, limiting them to flashes from one colour to the other. Now researchers at Standford University have investigated this behaviour further in an attempt to decipher the squids code. 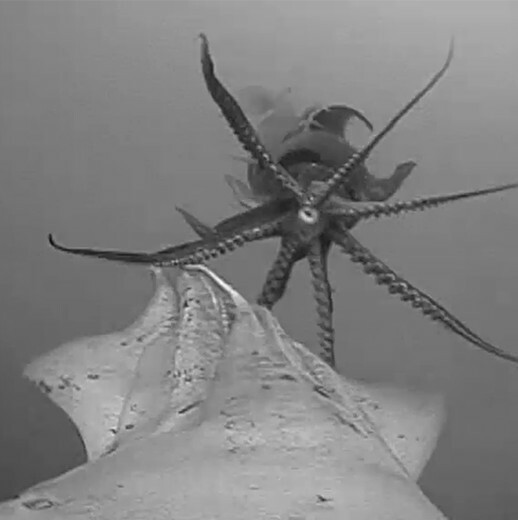 They attached ‘critter cams’ to the mantle of squids, in the hope of getting a squids eye view of the world, filming interactions between individuals to see if they could spot any behaviour that seemed to be related to variations in flashes. In the paper the researchers report a variety of different flashes, as well as flickering in a wave like pattern. The flashes were almost never observed whilst the squid was alone, suggesting squid use the changing colour of their skin to communicate with one another. The researchers however offer no explanation as to what may trigger these bouts of flashing between individuals, or what they might be saying to each other. Another, perhaps more unexpected finding outlined in the paper was the observation of periodic flickering in the presence of natural light. The researchers are confident that this is not just a passive behaviour in response to muscle contractions, and instead suggest that it may be a form of crypsis, a means of hiding in the open ocean. They suggest that the flickering mimics the look of light passing through the water column, perhaps making them more difficult to see. Quite how well this sort of camouflage would work remains to be seen, with further work required to understand how this might make them more inconspicuous. This research is promising, hopefully work will now begin on trying to decipher the language further, perhaps revealing another side to this fearsome ocean predator. The full article can be found here. (Subscription required).